Over time, the stairs in your home will start to show signs of aging, and the treads might actually sag. The treads are the horizontal part of the stair that you step on when going up or down. The vertical parts that the treads sit on are called risers. The treads and risers are attached to a carriage on the underside of the staircase that runs all the way up on either side. If you find that your stairs are sagging, perform a few basic at-home fixes to get them back to level. Inspect the carriage underneath the stairs, to ensure the treads and risers are flush with the carriage. Drill a screw through the carriage and into each riser and tread at a 45-degree angle so they're flush with one another. 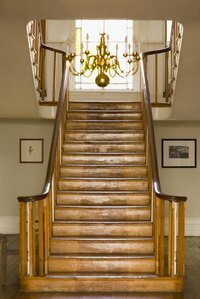 Measure the wood and screws carefully, so the screws won’t go all the way through to the top side of the stairs. Check the top of the stairs to see if the tread is still sagging. Add a wooden center support to the underside of the stairs to eliminate any sagging in the center of the treads. Cut the center support in a notched pattern to fit securely against the stairs, as the carriage does, from top to bottom. Drill one screw into each tread and riser at a 45-degree angle, the same as with the carriage. Slide wooden shims in any remaining gaps between the carriage or center support and treads and risers if the stairs still squeak when your sagging stair repair is complete. Measure the length of the underside of the staircase, and the risers and treads, to determine the length of the center support. Ask your local lumber yard to cut the notches if you can't. Use deck screws to snug the carriage and attach the center support. Choose a length that will hold everything in place securely but won't go through to the other side of the stairs. If your stairs still sag despite your repair efforts you may have to replace the staircase.